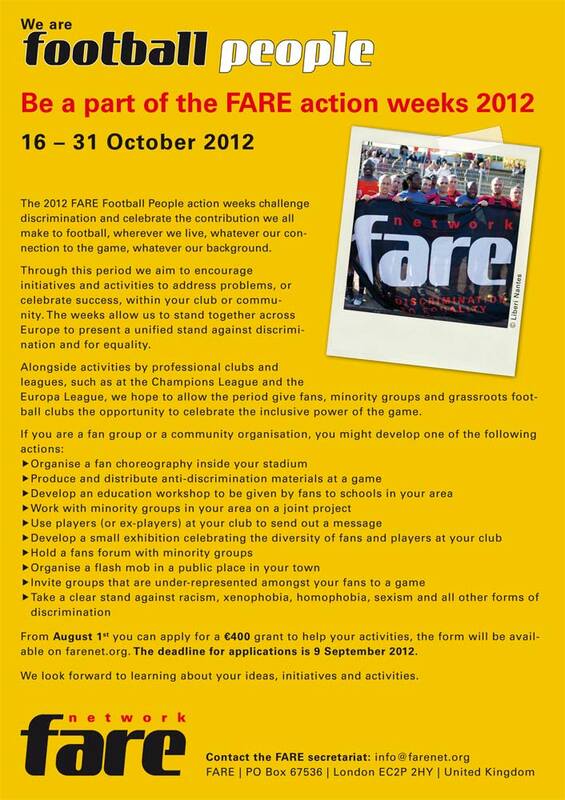 The FARE Action Weeks unites supporters, clubs, ethnic minorities and communities affected by other forms of discrimination across the continent in a concerted effort to make discrimination a thing of the past. The idea behind the Action Weeks is that a wide range of initiatives and activities that address local problems within their club or community and join groups across the continent to present a unified stand against discrimination in the game. The official FARE-Action Week Brochure for download. A key part of the activities are the events that further social inclusion by bringing people of different communities together through sport.What started as a minor campaign in nine countries in 2001 has now become the largest series of anti-discrimination activities in sport. In 2011 activities took place in 41 countries with some of Europe‘s top stars lending support to the campaign. FARE offers financial support for grass-roots activities at the community level. We are able to offer small- scale support for 200 groups with a maximum of 400 EURO. Get involved - join the FARE Action Weeks. The 2012 Action Week will be from the 16th until the 31th of October.